In case you need an invitation for visa use the Visa Invitation Form (4) on the WRC2015 website within two weeks of the registration or after fixing your travel plan. Processing time of invitation letters is two weeks. Act in time, please. We are happy to announce co-operation with Finnair. Finnair together with oneworld airline alliance is able to provide you connections from around the World. More information on oneworld co-op WRC2015 (5). Please use code OW01C15 when booking. 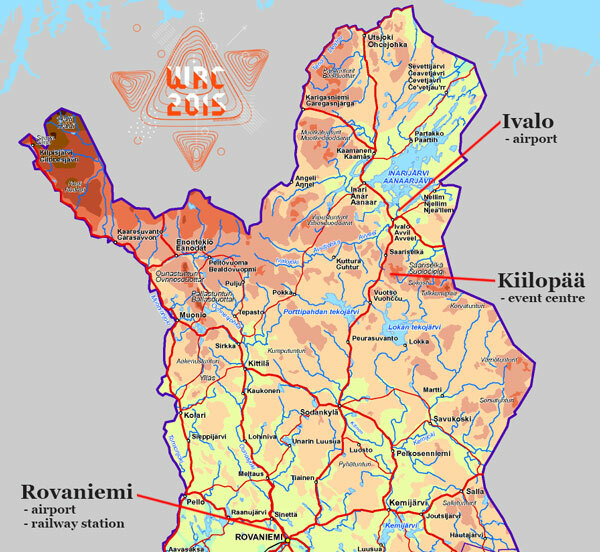 Nearest airport is Ivalo. Distance from Ivalo airport to competition centre at Kiilopää is 46 km. Finnair flies to Ivalo during summertime (6).. There is scheduled bus connection after each flight to Saariselkä and competition centre at Kiilopää. At the time of publishing this bulletin the cost of a ticket is Ivalo-Saariselkä 10€ one-way and Ivalo-Kiilopää 12€ one-way. To make sure there are places for everyone to travel from Ivalo to competition area or Saariselkä we are asking you to provide your transportation needs using the form (7). We will provide more details on how to book the ticket, at latest in Bulletin 4 on 14.7.2015. Biggest airport of northern Finland with flights operated by multiple airliners. Distance from Rovaniemi airport to competition centre at Kiilopää is 250 km. There is scheduled bus connection after each flight to Saariselkä and competition centre at Kiilopää. At the time of publishing this bulletin the cost of a ticket from Rovaniemi airport to Kiilopää or Saariselkä is about 50€ one-way. To make sure there are places for everyone to travel area we are asking you to provide your transportation needs using the form (9). We will provide more details on how to book the ticket, at latest in Bulletin 4 on 14.7.2015. In addition to flying a trouble free and relaxing means of travelling to Kiilopää from southern Finland is train. There are train connections from Helsinki, Tampere and Oulu. The overnight train departs from Helsinki in the evening and you will wake up in Rovaniemi in the morning. You should book a berth place for you to sleep in. They have private cabins for 2-4 persons on the train. Schedule and booking system is at www.vr.fi (10). Timetable is not yet published for the summer but we’ll keep you informed via our webpage (11) as soon as booking is possible. There is scheduled bus connection after each train to Saariselkä and competition centre at Kiilopää. At the time of publishing this bulletin the cost of a ticket from Rovaniemi airport to Kiilopää or Saariselkä is about 50€ one-way. To make sure there are places for everyone to travel to the competition area we are asking you to provide your transportation needs using the form (12). We will provide more details on how to book the ticket, at latest in Bulletin 4 on 14.7.2015. One option is to rent a car. You can find rental cars from every airport, from biggest cities and from Rovaniemi railway station. We have negotiated special prices for participants with Europcar (13). Please use code 52439375 when booking. We are organizing transportation between competition centre at Kiilopää and the village of Saariselkä for the weekend. To make sure there are places for everyone to travel we are asking you to provide your transportation needs using the form (14). The price will be 10€ round trip. The travel time between Saariselkä and Competition Centre is about 15 minutes. Training area open, with controls. 12:00 Closing of Competition Area. Competitors and assistants are not allowed to move in terrain. If you still need answers to some questions you can check our Frequently Asked Questions for answer (15). You can, of course, also contact us for more details, preferably using the contact form (16). There is a Facebook event for those competitors that for some reason are looking for teammate (17). If you are not using Facebook you can contact organizers via the form on website to get your need published on Facebook.